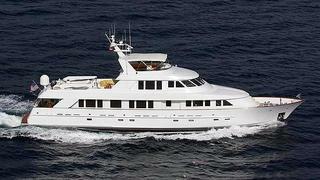 Recently sold as Phaedra, this 37.1m Delta motor yacht is renamed Time For Us and offered for charter through the Miami office of Burgess. Currently undergoing an interior refurbishment and various other upgrades including a Jacuzzi, she accommodates eight guests in four staterooms. Time For Us will be cruising the USA East Coast this summer at weekly rates from $77,000 in high season and $70,000 in low season.